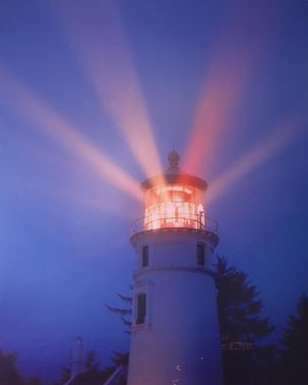 Ever wonder what is would like being a volunteer at a lighthouse? Or maybe you just wandered what is was like to be a volunteer, one who volunteers their time to a government facility and where the only renumeration is an RV site. Since that is what Linda and I are doing during the months of September and October, we'll give you an overview, then follow it up with the specifics of what we do including how we feel about. We had found out about the volunteer opportunities at the lighthouse last fall when we toured the lighthouse while on our annual vacation along the Oregon coast. Once we decided to quit our jobs and embark on this life on the road we now live, we applied for the position and soon found ourselves committed to the months of September and October. The process was very easy, fill out an application and mail back to Gaylyn Bailey who is in charge of the lighthouse. It was one of those positions where no experience at being a lighthouse guide was necessary, only a desire to do the job. The position involves two people, one to work the counter at the museum and one to give the tours. Some couples share both duties, while others split the work with one, usually the man, only giving the tours and other partner working behind the counter in the museum, which is how Linda and I are dividing the work. In late July a package caught up with us as we traveled the country. 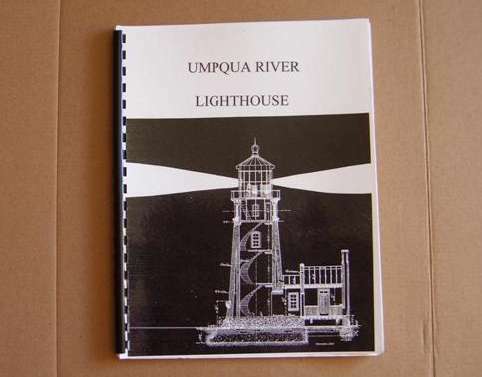 It was a very important package because it contained the booklet about our duties, background information and a sample tour of the lighthouse. It quickly became amuch read tome, smile, that was de rigeur bedtime reading night in and night out. The countdown to to T-day (Tour day) had begun. Soon we found ourselves on the road to Oregon. We actually arrived in Winchester Bay a week early and spent the time acquainting ourselves with the area. Could we have arrived on the day we were to start? Certainly, but having enjoyed this stretch of the coast so much while on vacation the previous year, we wanted even more time to enjoy it this year, smile. We were scheduled to arrive on the Sunday before Labor Day, so Saturday afternoon we drove up to the light house. We were pleasantly surprised to find Jim & Shirley on duty, the same couple who had been guides when we visited the lighthouse last fall. In short order we also met Gaylyn, the light keeper, managing director or whatever term you want to give to the person in charge. She even answers to, "Hey you," and as we quickly found out is an absolute jewel of a person. Before long we found ourselves involved in finding out what this volunteer thing was all about. Jim and Shirley swapped duties, so we each got to observe two different approaches to doing the jobs we would soon be doing ourselves. Our reading of the lighthouse book had really paid off and I found myself filling in the blanks, so to speak as I tagged along, first with Jim and then with Shirley. This proved invaluable as I picked up some additional stories listening to them tell about the early years of the lighthouse. It also helped me understand why everyone is allowed, even encouraged, to develop their own unique tour built around the basic facts. Jim and Sirley had said they would let us know when they had left in the morning, so when we heard a knock on our door the next morning we knew Jim & Shirley were on their way. Soon we were packed and headed up the hill to the lighthouse. We pulled into the parking area and quickly set up. Later we spent a little time with Ray and Virginia who we would be bird dogging tomorrow in preparation to our first day on the job, Tuesday. Soon the night had past and it was Lobor Day Monday morning. It turned out to be a very busy day and I went on a number of tours with Ray, picking up more tidbits of information each time out. Gaylyn really likes the way Virginia greets the visitors as they walk into the museum, so Virginia's greeting was written out as a guide for Linda to follow. Linda then personalized it to the point of being quite comfortable using it. We also discovered Ray and Virginia run a little contest each day to see who brings in the most donations. The lighthouse also sells commemorative coins for the Coast Guard Chief Petty Officers Association and Shirley is the unabashed queen of sales. It is a gauntlet Linda and I will take up. Let me add here that Gaylyn was way beyond supportive, she genuinely cares and you couldn't ask for a better person to be in the managers position. Enough about our training, which we both felt very comfortable with. Let me address the nuts and bolts of how this thing operates. There are four volunteer couples, two have RV sites right across from the museum (that's where we are), while the other two have sites just down the hill at the Douglas County campground in Windy Cove and all the sites have full hookups. The work schedule is designed so you only work two days a week at the most. If there are only three couples then the schedule is for three days on and six days off. It doesn't always work out that way, what with schedule switches, couples only working one month or days when everyone has to work because of school tours. As I write this we are in the midst of six consecutive days off. Not what I call a bad work schedule at all. Of course if those two or three days of work were 8 hours that would mean we would only be working 16 to 24 hours each per week. However they are not 8 hour days, they are 6 hour days. That's the beauty of volunteering at these types of places. It seems that most private business want you to work more hours or more days or both more hours and days for the same renumeration, a free site. We've done both and I would much rather work this schedule than one requiring us to work 5 days a week. Another plus is that the work is the same everyday that we work. 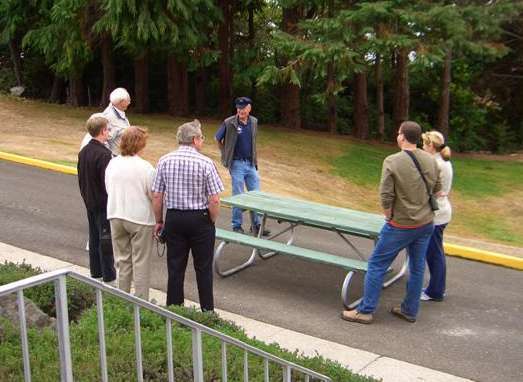 As with churches, we have found it pays to experience different situations. It is surprising what you will learn about your self, your likes and dislikes. The museum is open from 10 to 4, seven days a week, April through October and tours are conducted during those hours There is no set schedule for the tours and a late leaving tour may not be over until nearly 5 o'clock, meaning, depending on the situation,the day may stretch to 7 hours. We go over to the museum about 9:50 to open up, turn on the lights and put out the signs. While Linda is getting the museum ready, I put the sign out for the tours, then walk up to the lighthouse which is several minutes away, putting out another couple of signs, go into the lighthouse to turn on the ceiling lights. I also always take a few minutes to climb the stairs to the watch room and close my eyes. In these few moments I am magically transported back in time to a September morning in 1895. Now I am in the frame of mind to give tours. As I descend, I focus on the walls and the old cast iron stairs.The lighthouse keeper is going out to greet visitors after a nights work. Don't get me wrong, we don't give tours in character, but for me, it brings everything I will be telling the visitors about the lighthouse to life. That is the beauty of the way Gaylyn manages the lighthouse and the volunteers, each of us can give what we bring to the opportunity given us. 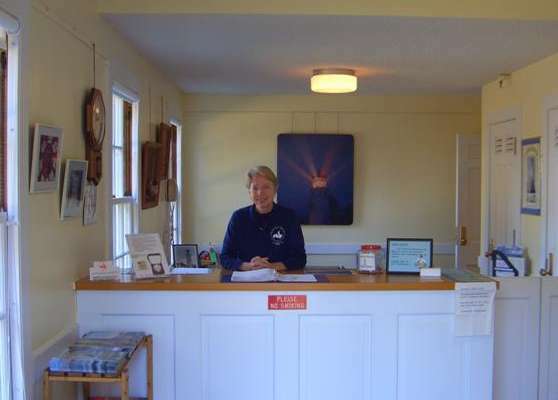 When visitors arrive, Linda greets them from behind the counter, asking them to sign in and place a pin on the map showing where they are visiting from. There is large map of the US and a second map of the world. It is amazing that we've had visitors from every state and many foreign countries. I especially enjoy the people who tell us they have planned their pilgrimage to these lighthouses for several years. Next she advises them where the restrooms are. Tells them about the free museum, but advises that we accept donations as she pats the donation jar, smile. Mentions the gift shop located downstairs and talks about the commerative Coast Guard coin available for only $20. Finally she lets them know about the tours of the lighthouse. Foggy mornings can be slow, but sunny weather starts bringing the visitors out. Fortunately we have been blessed with much sunny weather. 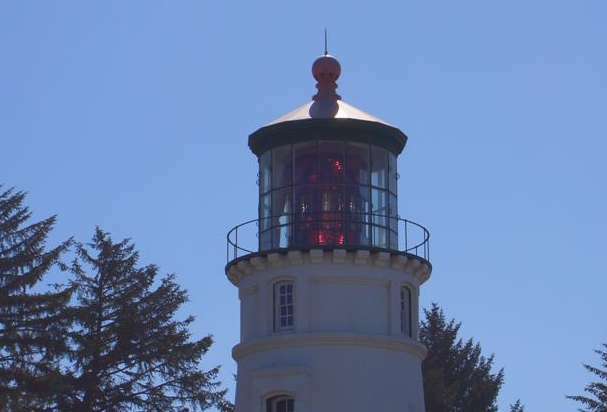 Next we walk up by the point and talk about the first Umpqua River Lighthouse, the oyster farm, Dunes National Recreaction Area and the whale watching station. Then it is off to the light house where we talk about the exterior before moving inside. Information and stories are woven together to bring the various parts of the lighthouse to life, including the workroom, the light keepers, the weight room, the first landing and the storage landing. Then we make the final climb of 18 steps up to the watchroom and catch our first glimpse of the queen of pacific coast lighthouses. A completely original, red and white, 1st order Fresnel lens, manufactured in 1890, that not only still works, rotating once every two minutes, but one you can actually climb up into. When the sun is right it is the most magnificent jewel you will ever see. But what we could classify as more like the Hope Diamond of lenses because this one is 10 feet high and 6 feet in diameter. The tour completed, I remind people to sign the register (hoping they will see the donation box is directly above it), then descend the stairs. Usually there is another group waiting to go on the next tour as soon as I return. If there was any communication that was needed between Linda and myself, we each have a walkie talkie furnished by the museum. After the last tour of the day we bring in the signs, balance the fees from the tours and post the accounts, lock the door and walk the hundred feet over to our home with the million dollar view. Volunteer, yes. Work, no, lol. May your days be as rewarding as ours! Nope. If you're looking for more on this homepage you may be having masochistic tendencies, but I must admit that every once in a while I surprise myself with just how good I can write. (I believe that is termed "Delusions of Grandeur", lol.) So don't be afraid to check out the rest of the website.